Stone Doohickeys are red statues in Wario World. They are statues that guard the boss doors. They resemble tall, thin pillars with a crest of the black jewel on top. In each level, Wario needs to gather red diamonds to give to the Stone Doohickey. The number of red diamonds necessary to remove the Stone Doohickeys increases in the later levels. 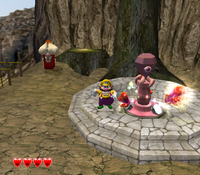 Once enough red diamonds are handed over, the Stone Doohickey disappears, enabling Wario to fight the boss. Each stage reqires a certain amount of red diamonds to fight the boss. The following chart demonstrates the amount needed per level. This page was last edited on February 10, 2019, at 02:11.